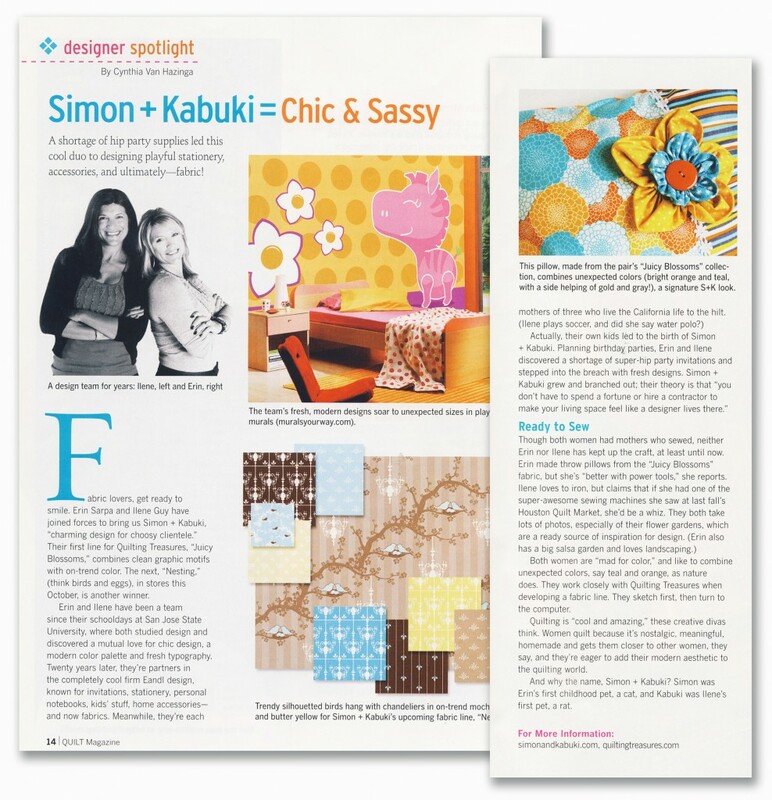 We are really excited to have been featured in Quilt Magazine this month. It is their October/November issue out right now. We are the designer spotlight. We were called several months ago by the writer Cynthia Van Hazinga. It was a great experience and really easy, much to our relief. She asked us great questions and really did her research on our company. It was fun to see how the process works and then see the final piece. There were a couple of funny things in the article that anyone who knows us well would have scratched their head at – I do play soccer but not water polo, those are Erin’s kids that do that. And I don’t love to iron that is just the method I use for sewing – iron-on patches and fusible hemming is the extent of my sewing and ironing skills! My mom is a great seamstress but unfortunately it did not rub off on any of her children. This is a scan of the actual article in the magazine, hopefully we look young and crafty! You can click on the image to see it in full size, easier to read that way! We love working with Quilting Treasures on new fabric collections and the article highlights our next fabric line, Nesting, which will be out soon. Juicy Blossoms our current line is being sold at quilt stores and online. Be on the lookout for a Juicy Blossoms fabric giveaway coming up soon. We will post the details here and on our facebook page.